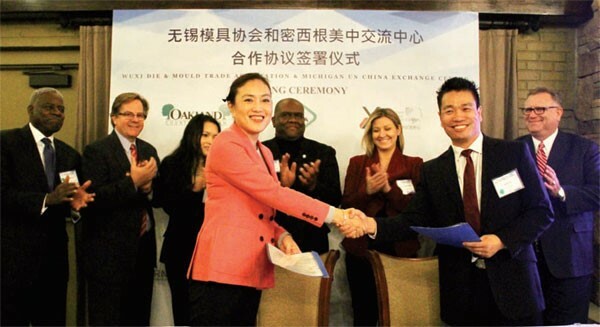 From November 7-9, the Detroit Chinese Business Association (DCBA) — in conjunction with the Bureau of the Ministry of Industry and Information Technology (MIIT) and the National Automobile Development Alliance — hosted the U.S./ China Auto Expo and Forum at Edward Hotel & Conference Center in Dearborn, Michigan. At the welcome dinner on November 7, Kerr Russell was recognized for the firm’s longstanding sponsorship of the DCBA. In addition, James Cambridge, member, was presented the “Sponsor of the Year” award, which reads, “A deep heartfelt appreciation for your ongoing support of the organization.” Cambridge, Chaoyi Ding (associate), and Roy Sexton (director of marketing) attended on behalf of the firm. On the second day of the expo, James Cambridge, member, and Chaoyi Ding, associate, networked with a number of Chinese and US industry leaders in the exhibition hall. Michael Gibson, member, joined Comerica’s Song Li, FINNEA Group’s Brian Dragon, and Doeren Mayhew’s Aaron Partridge for a panel discussion on mergers and acquisitions and best practices on securing and finalizing deals between US and Chinese entities. The panel was moderated by Doeren Mayhew’s Matthew Gurwin.